Dr. Gregory W. Goodreau, a Florida native, born in Panama City, is a member of a family of dentists—his father and sister are dentists as well. He received his BS degree in microbiology from Auburn University, and his DMD degree from the University of Florida College Of Dentistry. Dr. Goodreau established and opened his practice in Panama City Beach in 1994 and in 2006 moved to the current location. 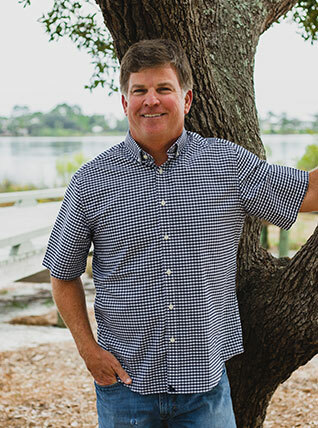 Dr. Goodreau is a member of the Chamber of Commerce, American Dental Association, Florida Dental Association, Northwest District Dental Association for which he was a past president, Bay County Dental Association. He has served on the FDA House of Delegates and the FDA Board of Trustees. He volunteers with the Give Kids a Smile program and Children’s Volunteer Health Network. Dr. Goodreau has two children Kristen and Hunter as well as twin grandchildren Ava and Ellie. In his free time Dr. Goodreau enjoys staying active, with biking, hunting, and fishing.